HUNTSVILLE, Alabama — Lockheed Martin is investigating other domains where its wide variety of proven missiles might operate in the future, and how new capabilities could be brought to bear to fill missile defense needs across the services, according the integrated air-and-missile defense vice president for the company’s Missiles and Fire Control business. 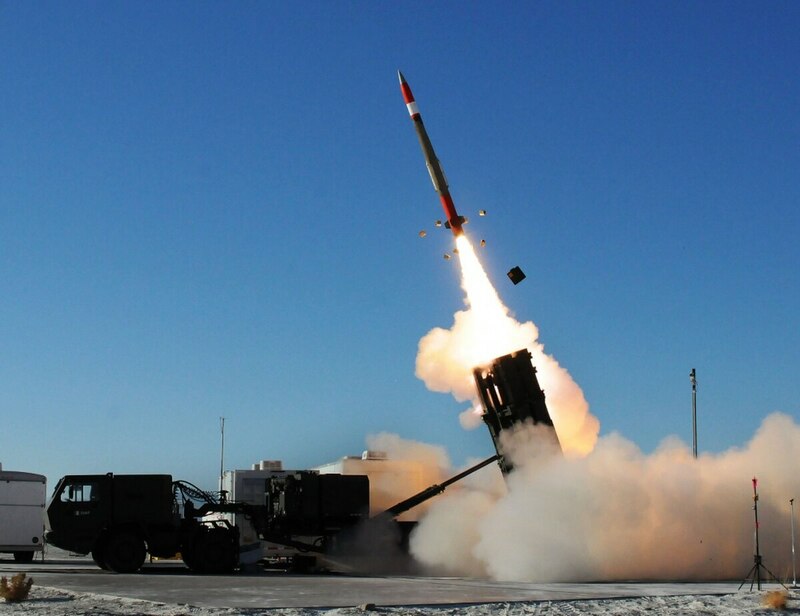 Lockheed’s staple, Patriot Advanced Capability-3, and the upgraded version — PAC-3 Missile Segment Enhancement, known as MSE, — as well as its Terminal High Altitude Area Defense, or THAAD, interceptors and its Miniature Hit-to-Kill missile provide a wide variety of capability within the portfolio. The company has built a family of interceptors that range from roughly 20 feet away to 20 inches and with that range, “you start saying, ‘Well, how can you start applying these systems and the systems that we’ve built, like PAC-3 and THAAD? How do you start applying them into domains that they aren’t traditionally employed in?” Tim Cahill told a small group of reporters at the Space and Missile Defense Symposium. “Can you put MSE missiles somewhere besides on land, somewhere as part of a Patriot battery, can it be on a ship? Can it be in the air? And so you look at how do we apply these great capable systems beyond just the kind of narrow domains they were originally envisioned for,” he added. Missiles and Fire Control is using its many internal partners at Lockheed to pair its missile capabilities with other sensors, such as the radar sensors for the Long Range Discrimination Radar, Space Fence and the Q-53 counterfire radar, for example, Cahill said. “When you start mixing and matching, can you find other areas where these existing systems can come to bear, and we are finding, yes, the answer is yes, they can,” he said. Cahill added there are some capabilities where Lockheed is “just on the verge” of getting a contract, so he declined to elaborate on what’s fleshing out as the company experiments with new configurations. “I think you are going to see some emerging capabilities rather soon and getting on contract, where you are going to see cooperation between key services that are going to be linking some of these systems,” he noted. Some of the other efforts are farther afield, but Cahill said a new trend is likely emerging where existing systems are linked together differently or capability is used where and how it was not used before. And neither is putting PAC-3 MSEs on ships, he added. But Cahill noted that on the airborne side, smaller missiles might be a better fit. Looking at the lower end of the spectrum, Lockheed is considering building a missile that fits in between PAC-3 and the Miniature Hit-to-Kill missile, something in the realm of six or eight feet, Cahill said, which seems to be the sweet spot. Cahill cautioned that the services are not at the stage where they are asking for anything specific, but Lockheed is trying to realize the potential early and stay ahead of the rapidly evolving threat picture. That includes considering how to get after challenging threats like hypersonic missiles. Cahill said Lockheed is still in the process of reaching an agreement on what kind of capabilities, for example, an evolved THAAD interceptor could go after. The desire to add extended range at the back end and more advanced sensing capability on the front end of the missile could give THAAD the capability to take out more advanced threats like hypersonics because it could take out a particular threat “before it has the chance to do the things it’s designed to do to defeat you,” Cahill noted.